Genetic mutations — changes in the order of the A, C, G, and T nucleotide bases that make up a gene — have been the primary focus of cancer researchers over the last several decades. By sussing out mutations involved in regulating cell growth and division, scientists better understand the molecular range of different cancers and consequently develop more targeted and effective therapeutics. In recent years, another type of genetic variation has captured the attention of researchers: epigenetic modifications. Best characterized in cancer, epigenetic changes are also thought to play a role in a range of other diseases, including autoimmune disease, cardiovascular disorders, diabetes, neurodegenerative disorders such as Alzheimer’s disease, and potentially even male infertility. In this WEEKLY, we’ll tell the epigenetics story and discuss how it’s being used to develop new treatments. Epigenetic modifications are changes to DNA that do not alter the actual gene sequence; they are chemical modifications to the DNA itself. These changes typically affect gene expression, or how often the gene is read by the cell. Epigenetic modification can occur either directly to the nucleotide bases themselves (A, C, G, or T) or to the histones, which are small proteins that package and order DNA. One of the most common types of epigenetic modification is methylation — the addition of a methyl (CH3) group to cytosine (C) nucleotides. The end result: methylation reduces or even blocks gene expression. 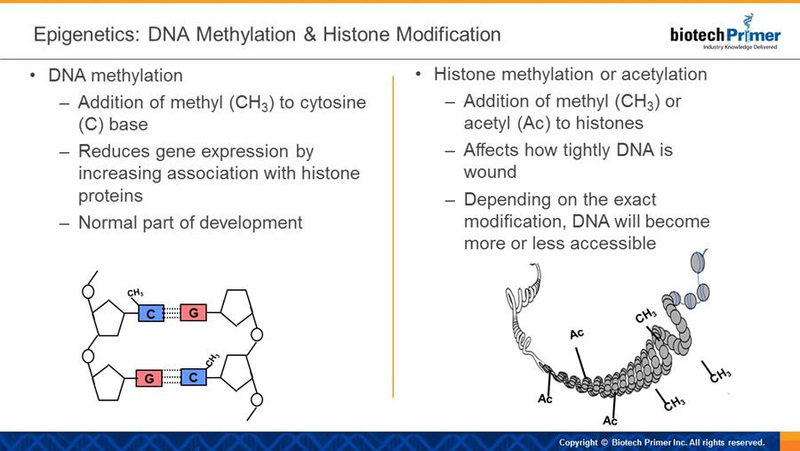 A second type of modification is called acetylation — the addition of an acetyl group (CH3CO) to the histones. Acetylation loosens the association of the DNA with the histones, making the DNA more accessible to the enzymes used in gene expression, ultimately increasing protein production. Deacetylation — the removal of an acetyl group — increases the association or “grip” of the DNA around the histones. Deacetylation makes the DNA less accessible to enzymes used in gene expression, thereby decreasing the production of proteins. Epigenetic modification is a normal part of development. This is in part why different genes are expressed in the heart than, say, the liver — the two different tissue types contain the same genome, but tissue-specific differences in epigenetic modification lead to differences in gene expression in the two tissues. Problems may arise, however, if variations in epigenetic modifications result in changes to gene expression. If a cell or tissue type begins to make too much of a protein that activates cell growth, for example, the cell could begin to divide too often — potentially leading to cancer. Alternatively, a cell could begin to make less of a protective protein, for example, a “tumor suppressor” protein (a protein that deactivates cell division), again potentially leading to cancer. Epigenetic medicine seeks to identify disease-associated differences in epigenetic modifications, and to develop drugs that restore the epigenome to that of healthy cells. Epigenetic drugs are small molecule drugs that target epigenetic regulators, or proteins that write, read, or erase epigenetic modifications. Writers are the enzymes that make the chemical modifications — methylation or acetylation as described above — to DNA molecules or histone proteins. Erasers are enzymes that remove these chemical groups. Readers are the proteins that detect and respond to these modifications, causing the DNA to be more or less tightly wrapped around the histone protein. Any of these proteins could be inhibited or activated to affect changes in epigenetic modifications. resulting in decreased expression of associated genes. 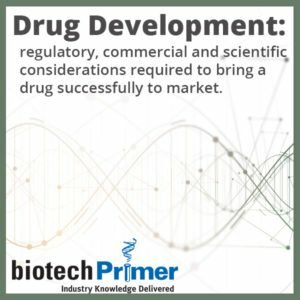 Two DNMT inhibitors have been approved by the FDA: Vidaza (Celgene) and Dacogen (Otsuka; Tokyo, Japan). Both drugs are used to treat myelodysplastic syndrome and acute myeloid leukemia. Histone-methyltransferase (EZH2) inhibitors: EZH2s are also writers — these enzymes transfer methyl groups to histone proteins. One EZH2 is associated with overactivity in a number of different cancers. 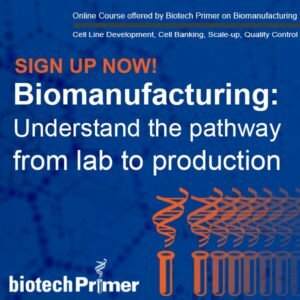 There are no EZH2 inhibitors currently approved, but several are in development, including Constellation Pharmaceuticals’ (Cambridge, MA) CPI-1205 in Phase I for advanced B-cell lymphomas, and Epizyme’s (Cambridge, MA) tazemetostat, currently in Phase II for non-Hodgkin lymphoma, certain genetically-defined solid tumors, and mesothelioma. Epigenetics promises to change the way we look at the human genome. 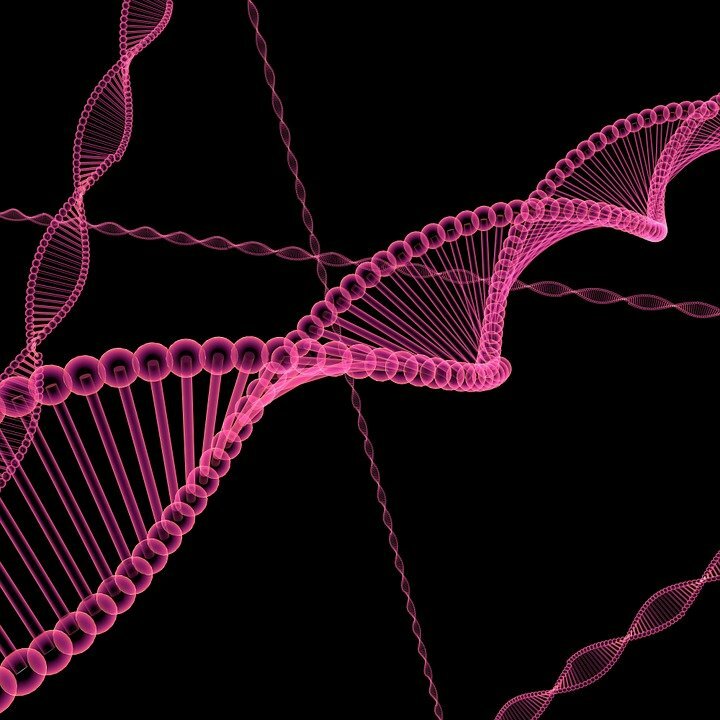 Scientists have made great strides in understanding how epigenetic modifications contribute to both health and disease; however, a complete understanding of these modifications is still very much a work in progress. As that work develops, researchers will undoubtedly uncover new drug targets and approaches to disease management. Stay tuned!